An evening hosted by Frank Cognoscenti and musicians from the Frank’s Place Jazz Orchestra for one off and regular events at venues and hotels. 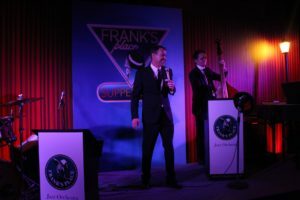 Frank brings the authentic live Vegas supper show experience to venues with a repertoire to suit listening whilst dining and dancing. His musicians are hand picked from his Frank’s Place Jazz Orchestra who frequently perform at the London Jazz venues such as Ronnie Scott’s , Pizza Express Jazz etc. This intimate musical experience sets the bar in quality and audience interaction beyond the standard tribute show experience. The repertoire includes all the hits, jazz standards and ballads, Sinatra made his own. Frank Cognoscenti is a professional singer and songwriter based in Surrey, England and self-confessed Sinatra enthusiast who has dedicated the last 16 years to solely performing the Sinatra repertoire for just about every conceivable purpose, from London to Singapore and most recently at Sinatra’s birthplace of Hoboken, New Jersey and Palm Springs California . Having meticulously studied and captured every nuance of Frank Sinatra’s live performances he is in constant demand for his services worldwide. Coincidentally the same height slim build and blue eyes as the man himself (he was used as a body double for Frank at Simon Cowells 50th Birthday party and for a ‘One show’ feature with Gyles Brandreth), plus a remarkable facial likeness to Frank circa 1960 coupled with a respectful, inspired, witty and subtle vocal impersonation in both singing and speaking voice making for a rare entertaining and engaging performance that is unforgettable for general theater goers and die hard Frank Sinatra fans alike. Exactly 50 Years Sinatra’s Junior, the same age as Sinatra at his peak.